Three Britons released from Guantanamo Bay after two years of imprisonment have told of the conditions they endured as terror suspects. The three - Ruhal Ahmed, 22, Asif Iqbal, 22, and Shafiq Rasul, 26, all from Tipton in the West Midlands - returned to Britain last week. They had been captured in Afghanistan, suspected of links to the Taleban, and were taken to the US camp in Cuba. The three told UK newspapers they were often beaten by US troops. Their claims of abuse come after similar descriptions by two other released Britons. But US Secretary of State Colin Powell has dismissed claims of mistreatment, saying Americans "don't abuse people who are in our care". Mr Iqbal said that while being held by US troops in Afghanistan they were made to kneel bent double, with their foreheads touching the ground. "If your head wasn't touching the floor or you let it rise up a little they put their boots on the back of your neck and forced it down. We were kept like that for two or three hours." Mr Rasul said he was also kicked, punched and knelt on by troops. The Tipton men said they were repeatedly questioned by British and American interrogators. They said they endured three months of solitary confinement in Camp Delta's isolation block last summer after they were wrongly identified by the Americans as having been pictured in a video tape of a meeting in Afghanistan between Osama bin Laden and the leader of the 11 September hijackers Mohamed Atta. Mr Ahmed said during an interrogation session in Afghanistan with an MI5 officer and another official who said he was from the Foreign Office, "all the time I was kneeling with a guy standing on the backs of my legs and another holding a gun to my head." But Mr Powell, told ITV's Tonight: "We have watched Guantanamo Bay very carefully, knowing of the interest of a number of nations, including the United Kingdom, and knowing that we have responsibilities under the Geneva Convention, and because we are Americans, we don't abuse people who are in our care." Mr Powell said it was "not in the American tradition to treat people in that manner" and the US had followed the Geneva Convention. "It is not a resort area in Guantanamo Bay, but at the same time, we did not abuse the individuals who were down there." A Foreign Office spokeswoman told BBC News Online it was "looking into" the allegations and the UK had done "more than any other country" for the detainees' welfare. For the flight from Afghanistan to Cuba, Mr Rasul said they had their heads shaved, body cavities searched, were dressed in orange overalls, given goggles and earmuffs, and chained. "The only thing that relieved the sensory deprivation and occupied me for the 22-hour flight was that I was in serious pain," Mr Rasul told the Observer. "The guards told me to go to sleep but the belt was digging into me - when I finally got to Cuba I was bleeding. I lost feeling in my hands for the next six months." He said initially he was scared of the interrogations, but changed his opinion when a young interrogator asked him: "If I wanted to get hold of surface-to-air missiles in Tipton, where would I go?" "Towards the end the questions just seemed stupid," he said. 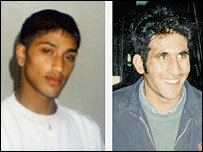 Mr Rasul said before they were released, the FBI tried to persuade the men to sign a form admitting links with terrorism. None of them did so. The claims by the trio echo previous claims of poor treatment made by two other released Britons - Tarek Dergoul, 26, from east London, and Jamal Udeen, 37, from Manchester. Four Britons remain at Guantanamo Bay: Feroz Abbasi, 23, from Croydon, south London, Moazzam Begg, 36, from Sparkhill, Birmingham; Martin Mubanga, 29, from north London, and Richard Belmar, 23, from Maida Vale, London. 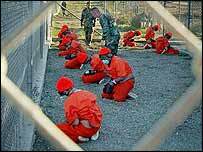 What next for Guantanamo inmates?